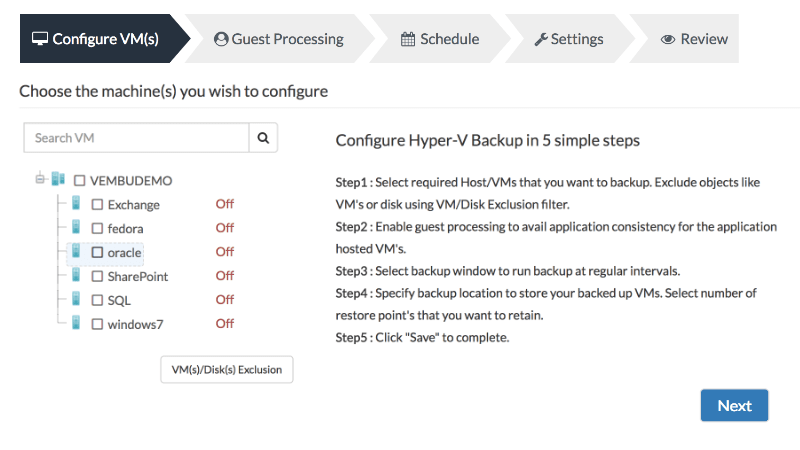 Vembu VMBackup delivers reliable and consistent backups with recovery points that span months and years. Protect your business critical servers running on VMware vSphere environments with an intuitive UI that addresses complex use cases with simple configurations. Built to pursue efficiency in data protection cost-effectively, without compromising on delivering enterprise level functionalities. If you are a small business, then Vembu BDR Essentials would be a perfect solution to cut down your expenses. Creating a virtual machine by setting up a Hyper-V server is easy but creating a backup policy for the VMs is arduous. Vembu VMBackup makes it effortless with its simple and intuitive UI that can handle diverse scenarios. It provides efficient backups that addresses all your current problems and your future requirements. With verified, application-consistent and instantly recoverable backups, Vembu VMBackup acts as a cost-effective business continuity and disaster recovery solution for your Hyper-V environment. Even a disaster shouldn’t disrupt your business. Limit your downtime to minutes by instantly launching your replicated data center and running business critical applications during the disaster. You can’t ensure business continuity just by backing up your VMs. You have to be able to recover them. 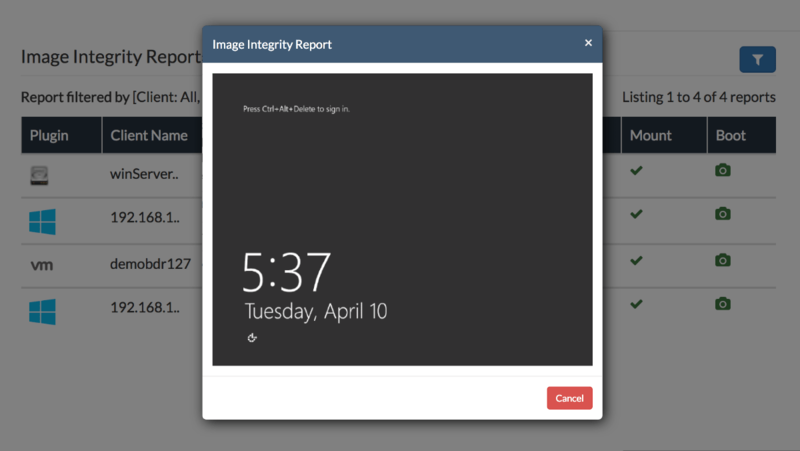 Vembu VMbackup verifies your backups automatically for you and sends you the boot image of the VMs over e-mail. Minimize the downtime of the critical VMs by recovering it instantly on any hypervisors like VMware ESXi, Hyper-V and KVM. Perform granular level restores of your backed up files and folders without processing the entire backup data. 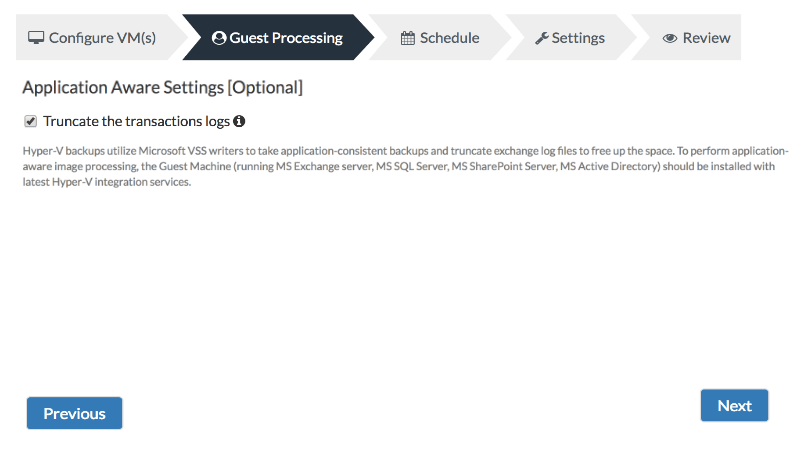 View and selectively restore the individual items of your business critical application (Microsoft Exchange, SQL, Active Directory and SharePoint) directly from the backup data. 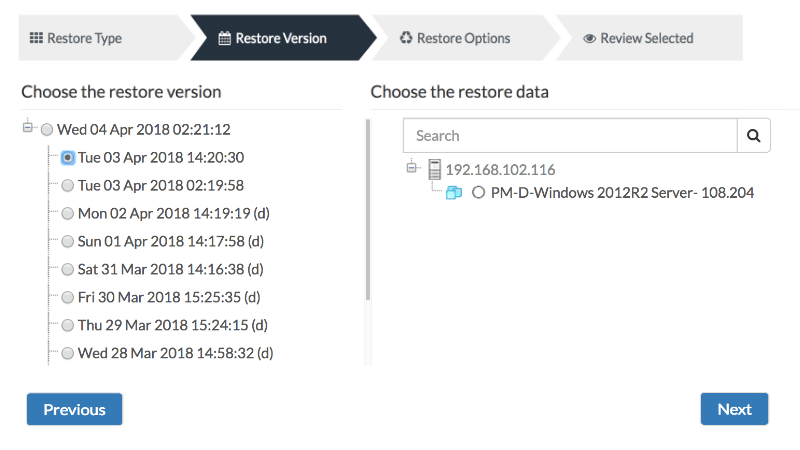 Restore only the required disks from the backup to the same VM or different one without restoring the full VM. Failover the production VM to the replica during disaster and recover along with the changes to the source host during Failback. 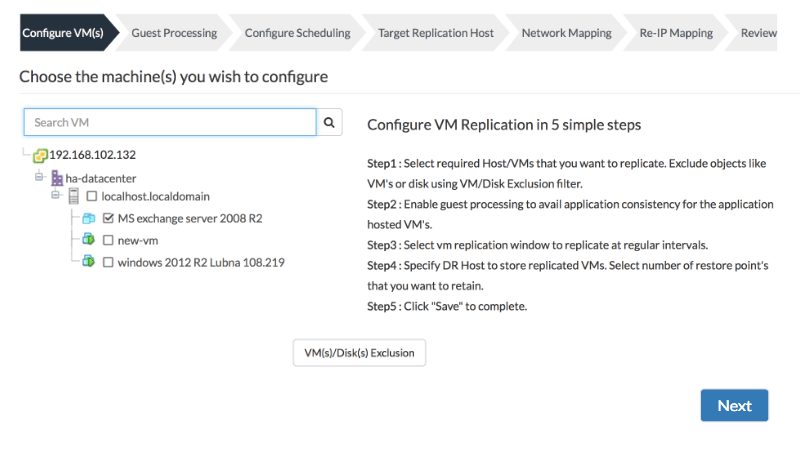 Migrate the backed up Virtual Machines from one hypervisor to another of your choice without any hassle. Vembu developed VembuHIVE – file system designed for large scale backup and disaster recovery applications with support for in-built compression, encryption deduplication. Use multiple storage targets. Use different storage media. Aggregate the space available to form storage pools. Select the required storage pools for specific backups. Prevent data migration that might eat into your network and clog your bandwidth by transferring the data using a local storage medium and migrating the incrementals over network. Recover the required files instantly, by virtually mounting the backup data on the Disk Management service. Replicate your backup data to Tape Storage for long term archival and disaster recovery purposes thus effectively implementing 3-2-1 backup strategy. Surge your data security measures by encrypting each of your backup jobs with separate encryption passwords that need to be entered while restoring or modifying the jobs. Create your own virtual lab. Launch backed up machines directly from storage repositories on Hyper-V or ESXi. Test virtual/physical machines without affecting the production environment and without using additional storage.